Like Wine? 2018 Cincinnati International Wine Festival Coming March 8-10! The Cincinnati International Wine Festival is celebrating its 28th year of giving back to local charities with wine tastings, gourmet dining, education sessions, silent auctions and more. The festival, set for March 8-10, has options for every palate, style and preference. One of the largest of its kind in the country, the festival is recognized as a premier destination in the Midwest. The popular festival features more than 700 domestic and international wines from more than 200 wineries. Thousands of people attend each year. The festival kicks off with winery dinners the evening of March 8, where guests will simultaneously experience the best of fine wines and fine dining at 18 of Cincinnati’s most prestigious restaurants. One price covers each multi-course dining experience with exclusive wine pairings presented by winery representatives. The festival continues March 9 and 10 with a variety of wine tasting and educational opportunities where guests will sample new and fascinating wines from around the world, paired with delectable bites. A charity luncheon and auction will feature limited-release and rare wines coaxed from the cellars of notable Cincinnatians, chef’s table dining opportunities at exclusive Cincinnati homes, fantastic trips, wine cellar tours and more. This year’s honorary festival chair is Darioush Khaledi of Darioush in Southern Napa Valley, California. Courage, commitment, and an entrepreneurial spirit best describe Darioush, who left behind a successful engineering career in his native Iran and emigrated to the United States seeking opportunity, freedom and personal liberty. Together with his wife Shahpar, he founded his namesake winery in 1997. Darioush is the realization of his American dream. Win this wine basket with a giveaway on the Cincy Chic Facebook page! 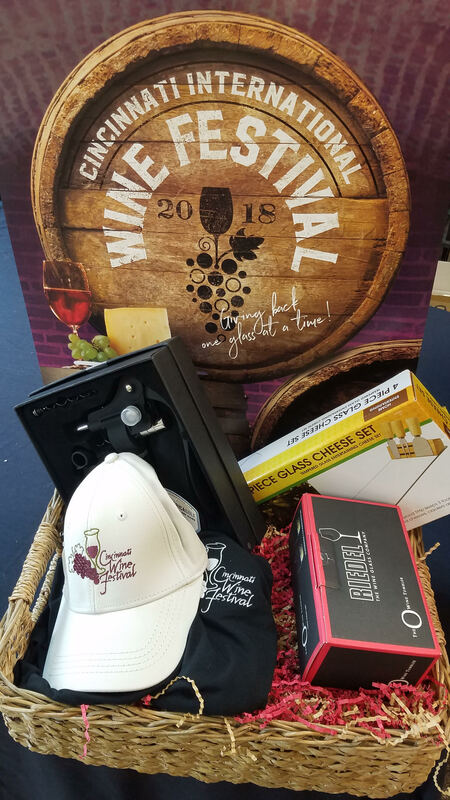 Each wine festival ticket purchased directly benefits 36 local charities with programs dedicated to the arts, education, health and human services. The festival has given more than $5 million to local charities since its inception in 1991 thanks to the support and patronage of the Greater Cincinnati community. The Cincinnati International Wine Festival is a Cincinnati-based, charitable, non-profit 501(c)(3) organization established to raise funds for local charities through the celebration of the wine industry. This year’s festival features 700 wines from more than 200 wineries across the globe. Kroger is the presenting sponsor. Festival proceeds benefit 36 Cincinnati and Northern Kentucky arts, education, and health and human services charities, distributing more than $350,000 in grants in 2017. The festival has donated more than $5 million to local charities since its inception in 1991. The patronage and support of the Greater Cincinnati community enables the festival to continue giving back locally, one glass at a time. Learn more and purchase tickets at winefestival.com. Watch my exclusive interview with the Executive Director Debbie Dent as she explains how to prepare for the Festival to get the best experience and also offers some helpful tips for how to properly taste the wine when you’re there. Oh, and check out our Cincy Chic Facebook page — http://facebook.com/cincychic — for a chance to win a FABULOUS wine lover’s gift basket valued at $200!